I am excited to finally announce the alpha release of EspressoReader. 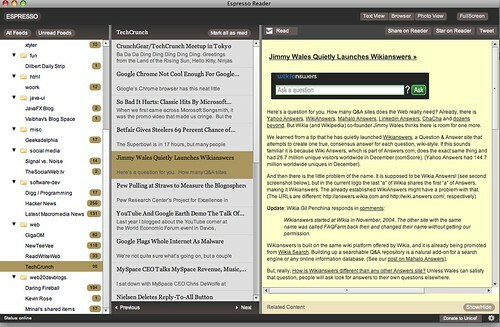 EspressoReader, in its current incarnation, is a desktop app for Google Reader. However the goal is to create an application for managing all the information streams you read on a daily basis, and providing user interfaces that help sifting through all of that. For example, this release includes a PhotoView that lays out all the images in different feeds one below the other, which works out really well if you are subscribed to image heavy feeds like web comics. Update: I am removing the link to the installer as more and more people keep having a broken experience with version 1. Please get on the alpha list for version 2 at EspressoReader.com. The new system should be a lot more stable since it uses a different authentication system that seems to be working much better. Other list of proposed features can be found here. Feel free to add to that list. Also the application is completely charityware. Please consider donating to Unicef if you find this application useful. 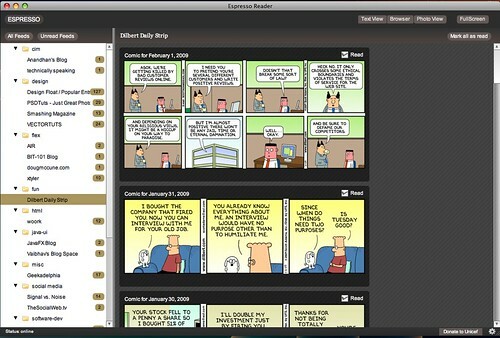 EspressoReader was built completely with OpenPyro. Cant see any feeds. Shame, looks good otherwise. App looks great but it doesn’t seem to be working, I’m on Mac OSX 10.6.1 and it is unable to setup any accounts. The application doesn’t working with actual AIR framework. The settings screen has null and we can’t add any feed settings. App dosent work, after reading all the threads seems like the creators are not bothered to fix it. Seems to be an email/password collection utility. Hi, Got same prob here, app is not working properly, Any body got a solution? Previous Previous post: Should the developer community fork the Flex project ?